Read how organizations can leverage their existing programming staff to build and deliver enterprise mobile apps. In the face of a corporate BYOD strategy, today’s enterprise companies are being inundated with increasing customer and employee demands for custom enterprise mobile apps. 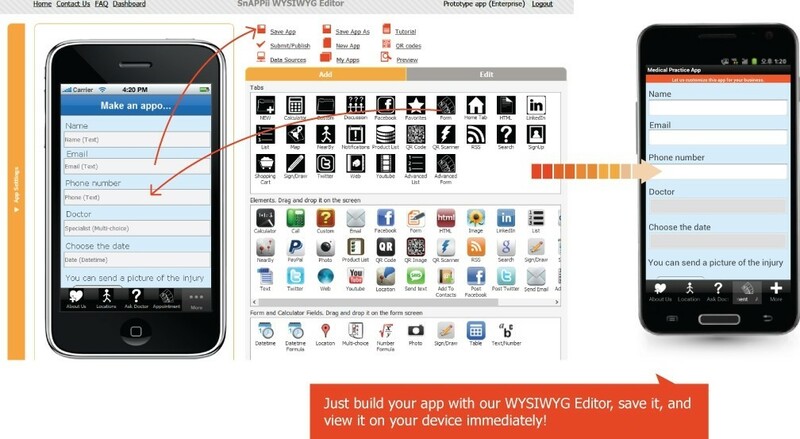 These apps must be data rich, robust and integrated with corporate IT systems and they must work on any mobile device. But mobile app development presents difficult challenges with complex programming tools, cross platform requirements, lengthy development cycles and a shortage of trained mobile app programmers. Another roadblock in enterprise mobile app development is the time and cost associated with cross platform development. Users are demanding integrated, native applications but there is no single mobile platform. The SDKs provided by Apple and Google only work for their own platforms. 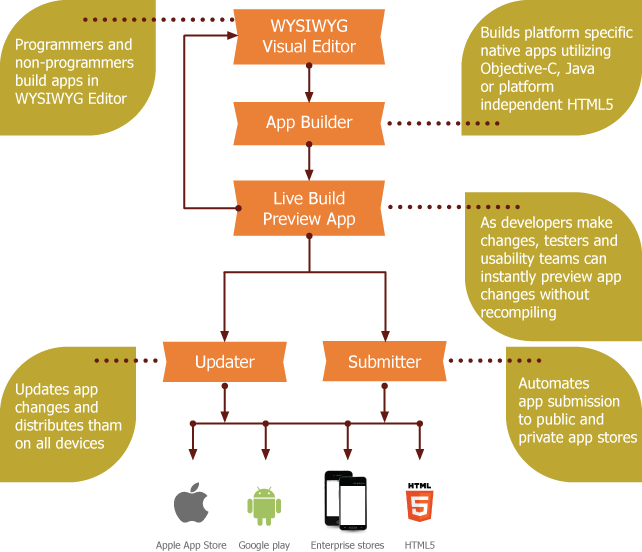 Developers must build apps for each platform separately, in different languages and with different tools. This can mean needing to hire two, or more, separate developers for each programming language which is a very costly proposition. IT organizations are flooded with requests for app development and many organizations are resorting to rapid hiring of in-house mobile programmers or outsourcing options. 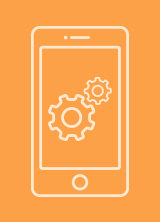 Hiring new obile developers is challenging as they are costly, scarce, and in high demand. Outsourcing means giving up development control to resources that don’t have a clear understanding of the company or business. Ideally, companies want to use their existing programming teams, but the the majority of in-house developers have not yet had mobile app training nor is the time or money available for that to occur. “Most organizations do not have many trained developers in mobile programming technologies . 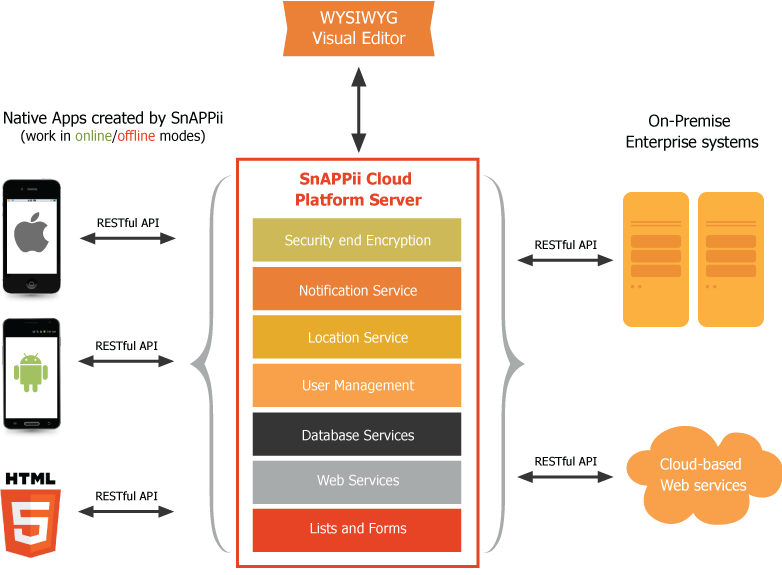 This limited resource should be used to enable other programmers in the company to create mobile apps. The mobile app development challenge is clear: The app backlog can only be addressed effectively if organizations can leverage their existing development teams to create mobile apps. SnAPPii is an online mobile app building platform created to allow companies of any size to easily and quickly make custom apps for their business without requiring any mobile programming skills. Utilizing the SnAPPii platform all developers can now build native apps without needing any training or experience in mobile programming. The visual drag, drop and configure method lets developers visually build once and Snappii can automatically create native apps for Android, iOS and HTML5. As a result, developers can work at a much higher level of abstraction with no source code is involved. 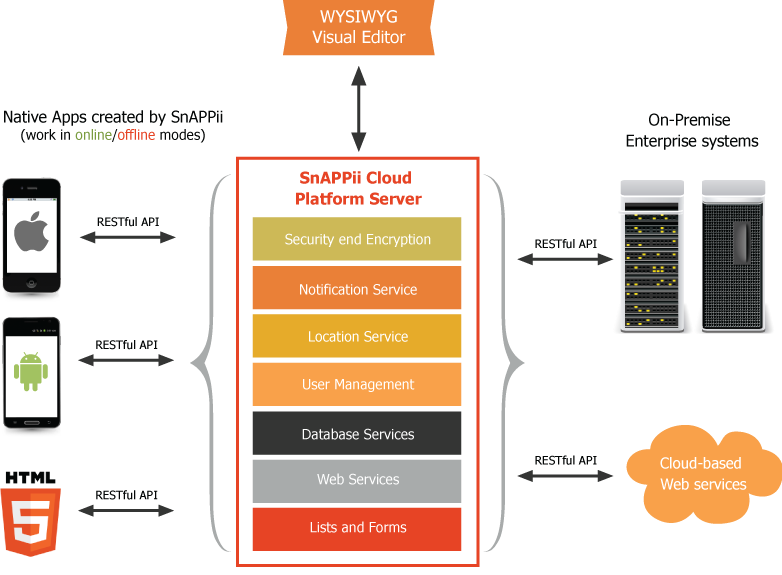 SnAPPii also provides a rich library of pre-built features and functionality for building sophisticated enterprise apps that access data from backend and cloud based servers. Organizations can leverage developers trained in mobile programming technologies to extend the Snappii platform even further with capabilities specific to their enterprise. The Snappii library allows significantly faster and easier development of feature rich native apps than using SDKs or Frameworks. Development work that takes weeks or months to complete using SDKs can be done in just days with SnAPPii. App updates to all user devices can also be immediately distributed with the single click of a button. Prototyping mobile apps is essential and needs to be done quickly. With SnAPPii, apps can be easily created, saved and immediately viewed on all smart devices. Just build in the editor, save, and review on your device! Being able to rapidly build and test apps and receive immediate feedback enables cost-saving development that is 30 times faster than using traditional methods. The SnAPPii platform also acts as a content management system allowing continuous updates with immediate distribution and monitoring of performance and usability. Utilizing the SnAPPii platform, organizations can address their backlog and leverage their existing programming staff to build and deliver robust enterprise mobile apps. The SnAPPii platform is open online to all developers. Anyone can begin building an app in minutes and sophisticated app builds take just a few hours to produce. Try it free today!